Outrageously funny and inventive, here’s a novel with huge appeal, especially to boy readers. The story takes place in the mists of Viking times, when people rode dragons and serpents swam the sea. Our hero is Hiccup, son of Stoick the Vast, chief of the Hooligan tribe. His best friend is Fishlegs, a runner-bean of a boy who’s just as frail and clever as Hiccup – traits that set them both apart from their oafish peers. When Fishlegs suddenly acts weirdly and starts shivering with fever, soothsayer Old Wrinkly diagnoses Vorpentitis, for which the only antidote is… the potato. There’s rumour that the chief of the bloodthirsty Hysteria tribe across the sea has one in his possession. 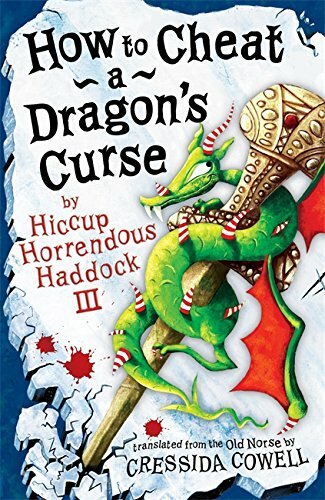 So Hiccup and his small band – feisty young Camicazi, daughter of Big-Boobied Bertha, his pet dragon and a surly Sabre-Tooth dragon – embark on a quest, shot through with danger and slapstick situations, in search of the magical but elusive vegetable. It’s hard to beat this story for sheer entertainment and larger than life, distinctive – and differentiated – characters. The writing is fast-paced, filled with jokes, language play and startling metaphors and similes that bring the characters and settings to life. The intrusion of the author’s voice and non-fiction elements – fact sheets about monsters and dragons, posters, footnotes and labelled drawings – add a playful irony to the storyline. Hugely appealing are the rumbustious drawings that drip ink spots all over the pages. Typography is also crucial to the story, with different fonts and words set in capital letters reinforcing its boisterousness.